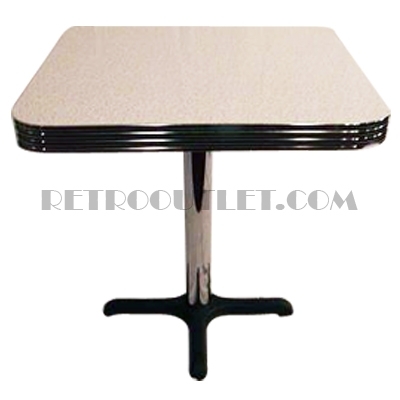 Bring retro style to your dining room, cafe, or restaurant with this 50s-style Retro Square Diner Table 30×30. This table is available in your choice of laminate, metal banding, and table base. Other sizes are also available. Table shown in picture has a classic chrome column with 2.25″ banding. Complete your set with two of our retro diner chairs upholstered in your choice of vinyls. All our tables come with a Two-Year Structural Warranty Against Manufacturer Defects on Bases and Tables.